Your little 2-year-old girl is at a very exciting stage in her life. She is becoming more and more independent and refining her communication skills. Some 2-year-olds can already speak quite well, while others are acquiring new words day after day. When it comes to other people, your little girl gets excited in the presence of others. Side by side they play, and even though they may not interact directly, they still enjoy each other’s company. Running around is very exciting, and so is jumping, clapping, and even dancing. The world is one big playground to explore, as curiosity and an eagerness to learn drive your little 2-year-old forward. For parents, this sense of exploration presents new challenges. You need to keep your little one safe, while still facilitating her hunger for learning and her adventurous spirit. Toys can help you to do both of these things. Apart from providing stimulating fun for your little one, they support your child’s development and growth in all areas; including language development, physical agility, logical thinking, social skills, motor skills, and hand-eye coordination. On her own or with other people, she can have fun and learn at the same time. Luckily, there’s no shortage of excellent toys. We’ve spoken to countless parents to compile a list of best toys and gifts for 2-year-old girls. Their advice, combined with my own experience as a mum of two toddlers has resulted in the following top toy list. Take a look and see if you can find one or more toys that you think might stimulate and encourage your little girl. All of the toys featured are suitable and safe for 2-year-old girls. We had a musical playmat at home and my kids just loved it. The music plays when you step on it, making walking all the more exciting for your little girl. 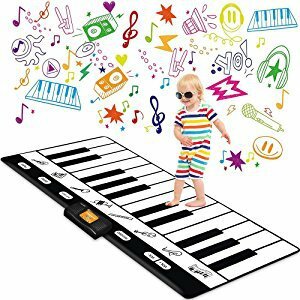 This mat measures approximately 19” x 54” and on it, you have piano keys as well as activity buttons. Your little girl can play a piano tune as she walks back and forth, or listen to one of 20 different songs. Not only does this mat play piano music, but you can also set it to play the sounds of five additional instruments. What’s more, she can listen to 4 different animal sounds or play rhythm activities. This colorful mat provides plenty of stimulation and helps your kids to develop musicality while encouraging physical activity. The mat is made from PVC, so you can easily wipe it down if necessary. She’ll rarely get tired of it, but if she does, the mat rolls up for easy storage. The mat requires 3 AA batteries. What’s Great About It – Music and movement provide hours of fun and stimulation. With this mat, your little girl can develop an ear for music while getting steadier on her feet each time she plays. The mat will still provide plenty of entertainment when she is a little older. Finally, joint play is awesome with this mat. This bowling play set is one of my favorite family toys. Everyone can join in and have lots of fun. Your little 2-year-old might well turn out to be a better bowling player than you! She can bowl with her siblings, friends, care givers, or parents - anyone can have fun here. With this set, you get 10 pins and 2 bowling balls, all of which are soft and child-safe. Both the pins and balls are made from soft foam. Nonetheless, the set is also suitable for outdoor use. No need to worry about anyone getting hurt by a ball. The weight is perfect too, with both the pins and balls easy to handle for 2-year-olds. She will enjoy a game of bowling. In the process, she’ll improve her hand-eye coordination, learn to compete, and become aware of game rules. What’s more, she will engage in physical activity and familiarize herself with ball games. The 7.5” pins come in different colors, each featuring a different number so that your little girl can begin to learn numbers and counting. If you are looking for a fun family game that everyone can play, this might be your front runner. 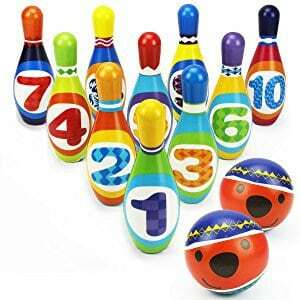 What’s Great About It – This set provides a fun activity for the entire family, and when you are busy, your little girl can simply put in some solo training for your next family bowling competition. Little girls soon want to get involved in the kitchen, and this toy allows them to get cooking and use their very own oven. But this is an oven with a difference, as it provides lots of learning options and opportunities. Included with your purchase are 3 slices of bread, 4 slices of pizza, 1 fried egg, and 2 cupcakes. In addition, you get a skillet, spatula, baking tray, and 2 plates, so your little girl will have everything she needs for some cooking fun. During play, she will hear the oven sing and she will learn to recite useful phrases. What’s more, she will learn about colors and numbers, and, of course, serving and sharing. The sound effects are excellent. When she places the skillet on the stove, she’ll hear a sizzling sound and hear the timer tick. With this oven, your little princess gets to take charge of her own oven and cook for you and others. She’ll learn how to count, divide, and share. 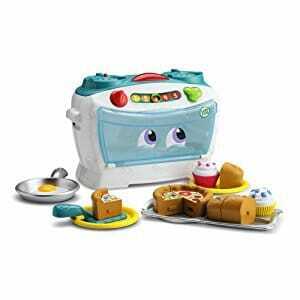 What’s Great About It – My little girl adored this oven. She cooked for everybody, and organized lots of tea parties for her dolls. She played with it from the age of 2 up to the age of 6. It was a pleasure to see her grow in confidence and develop her social skills while playing with this toy.In the end, she developed a real love for cooking and we went on to create many real life dishes together. With this jumbo bead set, your little girl can create her first bead chains. Included in this set are 36 colorful BPA-free beads and 4 strings for the creation of awesome giant bracelets and necklaces. Using the beads, your little girl can improve her fine motor skills and learn to color-coordinate. In addition, they get to be creative and have fun. The beads and strings are easy to handle for small hands, and still manage to challenge and teach your little girl. ​Beading is also an excellent way to improve hand-eye coordination. What’s more, your little girl will become deeply engaged in lasting activities. ​Some little girls also use the beads as blocks, building and creating amazing constructions. Because the blocks come in different shapes and sizes, they are ideal for color and shape-sorting activities. 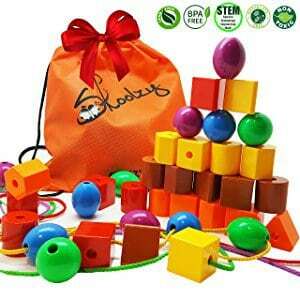 ​And when your child is done playing, she can store all of the beads and strings in the convenient bag. She can even bring it along on vacation. ​This set is both safe and durable. The beads are BPA-free, non-toxic, and comply with the ASTM standards. What’s more, you can get your money back if you are not entirely satisfied. What’s Great About It – This bead set provides lots of learning activities and can help your little girl to develop her fine motor skills. The better her motor skills, the easier learning to write will become, so this is a great preparatory toy. Not all kids like having a bath, but with this toy, they will love it. 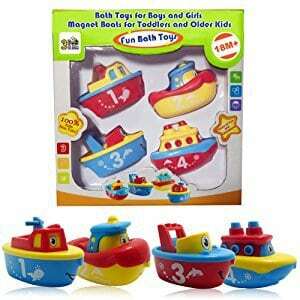 This set includes 4 colorful boats that provide plenty of bath time fun. This set is durable as well as phthalates, BPA, and lead-free, and is safe for your little girl and for the environment. Each boat has a number so that your little girl can learn to count and recognize numbers. In addition, each boat contains a magnet allowing your little one to hook them together. This type of activity helps to develop fine motor skills, while the boats are also ideal for make-believe play. ​My little girl organized her own boat rescue missions, staged storms, and loved how the boats made bath time so much more fun. ​Because the set is so durable, we used it for many years, with each child having fun with it from the age of two all the way through to the age of 5. What’s Great About It – There will be no more bath time battles! In fact, with this set, your little darling won’t want to get out of the tub. This set may seem simple, yet it helps to develop creative play as well as fine motor skills. 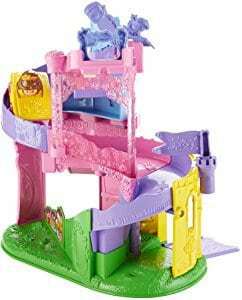 A princess racing down a magical princess track is exactly what you get with this Disney play set. Your little girl can place Princess Belle into her car, put it at the top of the track, open the gate, and watch her race down the track. When she passes the finish line, the flag waves, music plays, and lights flash. Little girls don’t just like dolls, many also love cars. This is like a toy garage merged with a princess castle. The track is beautifully set on stilts, decorated, and colorful. While playing, your little girl can improve on her motor skills, and she’ll delight in the princess’s high-speed adventures. This toy is great for imaginative play, as your little girl can create her own storylines. She will also learn about cause and effect, and experience how to achieve them. ​Made from durable plastic, this playset is portable and provides entertainment for hours on end. What’s Great About It – Princess meets fast twisty car track! For little girls, this play set is magical and offers so much more that goes beyond fun and excitement. What’s more, she will love this play set just as much as she gets a little bit older. Experts have emphasized the many benefits that puzzles can have on a child’s development. Multiple skills are involved here. Kids improve their hand-eye coordination and fine motor skills. And they also tackle problem-solving tasks. In addition, their memory is getting a workout, and so are their color and shape recognition skills. This puzzle offers all of the above development opportunities. Included in the set are two wooden chunky-piece puzzles. Both the Minnie wooden chunky puzzle and the Minnie dress-up puzzle feature easy-to-handle pieces. Your little girl can complete the puzzles or use the pieces for imaginative play. In the process, she will learn to match shapes and colors, while also enjoying dressing-up activities. 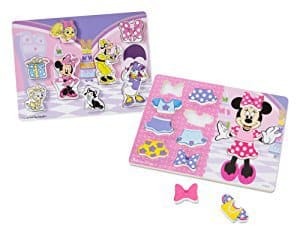 The dress-up puzzle contains 11 pieces, while the Minnie puzzle has 8 pieces. Because the pieces are made of wood and are quite thick, they can stand up, which is great for pretend-play. What’s Great About It – There are no bells and whistles here, but your little girl will love this set and develop multiple important skills. I love the simplicity of puzzles and am still impressed by all the learning opportunities they provide. Dinosaurs captivate kids and adults alike, and this set is a great introduction to their world. On purchase, you get four colorful dinosaurs on wheels, so your little girl can race them around and have lots of fun. 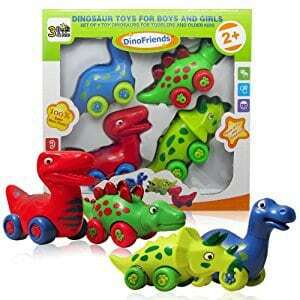 Made from child-safe materials, these dinosaurs are BPA, phthalate, and lead-free. The durability is also impressive, though it’s best not to immerse these guys in water. During play, your little girl will improve her motor skills, and develop pretend play, while also learning about dinosaurs. The fact that they are on wheels is an immense bonus. My kids used to play dinosaur racing and had lots of fun in the process. What’s Great About It – Give a kid a dinosaur and she’ll be happy for hours! This set come with four different dinosaurs, all of them on wheels. There is lots of learning and lots of fun to be had with this set. The Leaptop is a great introduction to computer technology for little girls. 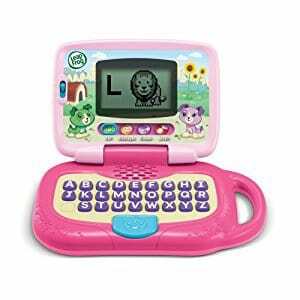 To begin with, your little girl will feel very important with her very own laptop. What’s more, this laptop is packed with fun activities, giving your little girl a head start in letter recognition, reading, and spelling. When she is still small, she’ll enjoy the games and music. She will also love the critter animations. As she gets older, she can get down to some serious ABC’s and messaging activities. This toy will grow with your little girl. The buttons and screen are big enough for little ones who will soon figure out how to use this toy. In general, kids very easily pick up how to use technology devices, and this laptop is a great computer starter kit. Made from durable plastic, this laptop features a convenient handle and closes like a real laptop. What’s Great About It – This toy laptop provides an abundance of learning options for 2-year-olds and pre-school kids. If you would like to introduce your little girl to computers, this might be a top option for you. With this set, your little girl will feel like a little lady. 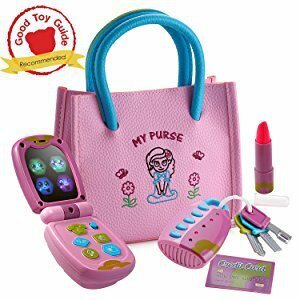 The purse comes with a flip phone, a bunch of keys with a light-up remote, lipstick, and a credit card. She will be able to put all of these accessories into the cute pink purse. All of the items are non-toxic and child-safe. This purse and accessories set provides the scope for lots of imaginative play. Your little girl can pretend to go to work, drive home, and put on makeup. She can even go shopping with her credit card. Little girls love to be like their mom, and with this set, that’s easy. Each item has its own special features. The remote lights up when the buttons are pressed. The phone features different buttons and a screen that doubles as a mirror. The purse fits all of the accessories, and your little girl can close it with the Velcro straps. What’s Great About It – With this set, your little girl will blossom into a little lady. She’ll develop critical thinking skills and learn how to interact with the world around her. How about giving your little girl a pretend puppy with its own carrier bag? This one has lots of added learning features. While she will adore her puppy and look after it, she can also listen to songs and learn the alphabet. With this set, your little one becomes a puppy owner, making this a great toy for imaginative play. The set also includes puppy food, a comb, ball, and bottle - everything she needs to care for her puppy. The carrier itself offers lots of learning opportunities. By sliding the letters on the side, your little girl can play more than 100 songs and phrases. She will also learn a few letters in the process. In addition, she can press the number buttons and see them light up. When the puppy is tired, your proud little pet owner can put her puppy into the carrier and shut the door. Transportation is easy thanks to the convenient handle. What’s Great About It – This toy is great for role play and imaginative play, allowing your little girl to develop her social and caring skills. As she gets a little older, she’ll develop an awareness of letters and numbers, which will help her when she starts preschool. This toy has a good lifespan as she will still love it even when she is a little bit older. 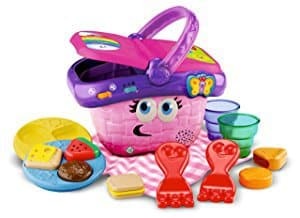 This is a 14-piece picnic basket that provides hours of fun and learning. You get a beautiful basket with 6 food items as well as cups, plates, cutlery, and a blanket. Your little girl will learn about sharing, matching, and organizing. You can take her on outdoor picnics and let her enjoy playing make-believe. Or she can organize a teddy bear’s picnic and bring her dolls. All of the items fit into the basket, so she’ll also learn about filling, emptying, and cleaning up. The basket itself plays a variety of sounds and songs, providing even more entertainment. Altogether, the basket features 30 audio responses for your little girl to discover. ​Made from child-safe materials, this basket is also very portable, which makes for a great travel toy. What’s Great About It – This toy offers lots of fun picnic options, while also providing plenty of learning opportunities. What’s more, your little one can have fun playing with it by herself or with others. This is one of my personal favorites, because it’s entirely made of wood and is simply beautiful. Apart from offering lots of variety for pretend play, this set helps to improve life skills, social skills, and fine motor skills. The set includes wooden utensils, pots, pans, pretend food, salt and pepper dispensers, a chopping board, plates, cutlery, and a large knife. 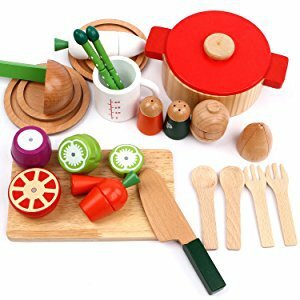 This set is excellent for group play as kids can prepare meals together and enjoy eating them too. The solid wooden pieces are sturdy and gorgeous at the same time. While playing, your kids can develop their fine motor skills, and learn about cooking, sharing, and organizing. In addition, they will communicate with each other and have fun together. You can be there to help, or ask your daughter to cook for you. This set will serve its purpose for years to come as the manufacturer deems it suitable for 2 to 7 year olds. What’s Great About It – This is an awesome wooden food and cooking utensil set. It is designed to encourage skill development and provide lots of fun playing opportunities. This is a doctor-themed magnetic drawing board, ideal to inspire creativity in your child. Great for long drives or flights, this toy provides plenty of stimulation. Featuring an easy-to-hold pen and a selection of stencils, this drawing board helps to develop your child’s fine motor skills. It also introduces her to numbers and letters. Because it is doctor-themed, your little girl will learn about her body and a variety of health topics. Using the pen and stencils, she can create lovely pictures and wipe them off when she’s done. Doc McStuffins and friends help your little girl to learn and grow. This toy introduces the concept of writing to your daughter. 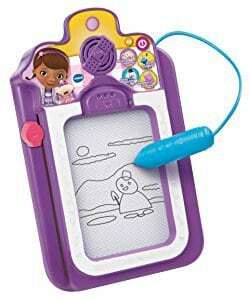 The Doc McStuffins drawing clipboard features 4 different learning modes and 15 different songs. Its letter recognition technology will go a long way towards introducing your little princess to writing. What’s Great About It – This is a very portable magnetic drawing board that is packed with learning activities. What’s more, your little girl can learn about visiting the doctor and various health topics. 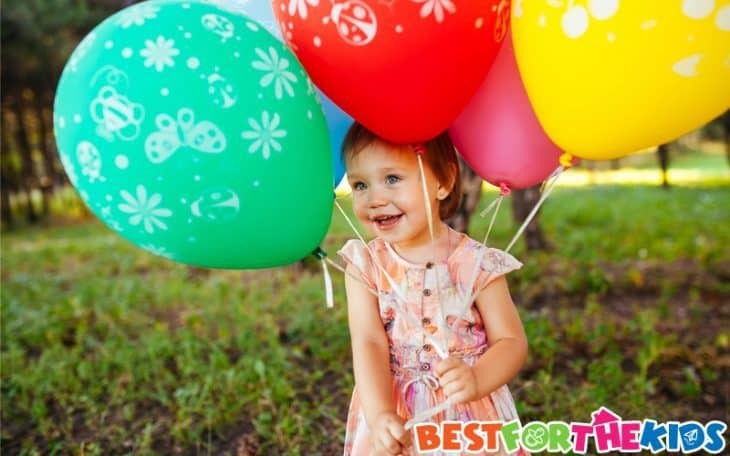 This is our selection of the best toys and gifts for 2-year-old girls. No doubt, you will find one or several to suit your favorite little girl. All of them will help her grow and develop her skills, preparing her for school and later in life. Choosing a good toy or gift for a 2-year-old is not an easy task, but remember - she will get a lot of fun and learning out of the toys on our list. These toys have proven very popular. If you’re still unsure, read on to find out about the must-consider aspects. Is the Toys Safe: Even though your little girl is no longer a baby, safety is still the prime concern. 2-year-olds have no concept of risk and danger, so you are in charge of her safety. Check out the manufacturer’s age rating on the toy. It’s also important to ensure the durability of the toy. Toddlers of this age still put small parts into their mouth, even though they are less likely to do so than babies. Furthermore, it’s worth checking that the toys are made from non-toxic materials, just in case. Will She Have Fun: Don’t just buy toys that are only educational, make sure that your little one will have fun playing with it too. What’s more, poke her curiosity. 2-year-olds are very curious and inquisitive, so they need toys that provide plenty of stimulation. It’s best to get a toy that stimulates, educates, and entertains, all at the same time. That way, she’ll learn without even realizing it. Does the Toy Teach Her Something: The toys available nowadays are often designed to have an educational value. They teach kids early math and reading skills, which will benefit your child when she enters preschool. Even if your little princess only learns about colors, she’ll benefit. So, when buying for a 2-year-old, it’s also important to start thinking about her preschool development. Toys that encourage learning math, verbal, and social skills are especially suitable. At this point, you may also like to encourage her to play with other kids, and some toys are more suitable for joint play than others. Is the Toy Portable: If you can bring a toy on a long journey, or even a shopping trip, it’s a major bonus. I’ve often been glad to have my little girl focus on her toy rather than getting into all sorts of trouble when we were out and about. That’s why portability is so important. What’s more, portable toys can become a great source of comfort and security because they are then constant companions. How Long Will She Play with the Toy for: How long would you like your little girl to play with the toy for? For just a few months or perhaps a few years? You need to remember that your little girl is growing and developing rapidly. Toys that grow with her are better. For instance, she can still use a drawing board when she is 5, but she won’t be using a very basic counting toy at that point. Playing Together or Playing Alone: While 2-year-olds often start out playing in parallel, they soon begin to interact and play together. Toys that lend themselves to joint play are great, however, you may like to choose a toy that is suitable for both solo and joint play. Kids also need to learn how to occupy themselves. Will the Toy Challenge Her: If a toy manages to stimulate her curiosity and get her to figure stuff out, the better for your daughter. Some toys incorporate basic problem-solving activities which are highly engaging. While she figures out what to do, she is fully captivated, and when she’s solved the little problem, she’ll get a great sense of achievement. Figuring out what button to press to get a certain reaction, or how to do a puzzle provides plenty of stimulation as well as a chance for her to succeed. Does the Toy Get Her to Be Creative: Pretend play is one of the most beneficial activities for kids. They imitate real life and learn to deal with a wide variety of situations and issues. Toys that lend themselves to imaginative play are therefore a top choice. Role playing, make-believe and using their imagination is what kids do much better than adults. In our selection, we’ve tried to provide you with a wide selection of toys. All of them will help your little girl grow and develop, each in a different way. All of the toys on our list are safe bets. At this point, your little girl has developed her own little personality, as well as likes and dislikes. Respond to that personality by choosing a toy that you think she’d enjoy. By the same token, try to widen her horizons once in a while, so that she can learn new things. As long as the toy is safe and provides plenty of variety for fun and learning, you can’t really make the wrong choice. And if you find a toy that you can enjoy together or she can enjoy with her little friends, it’s even better.